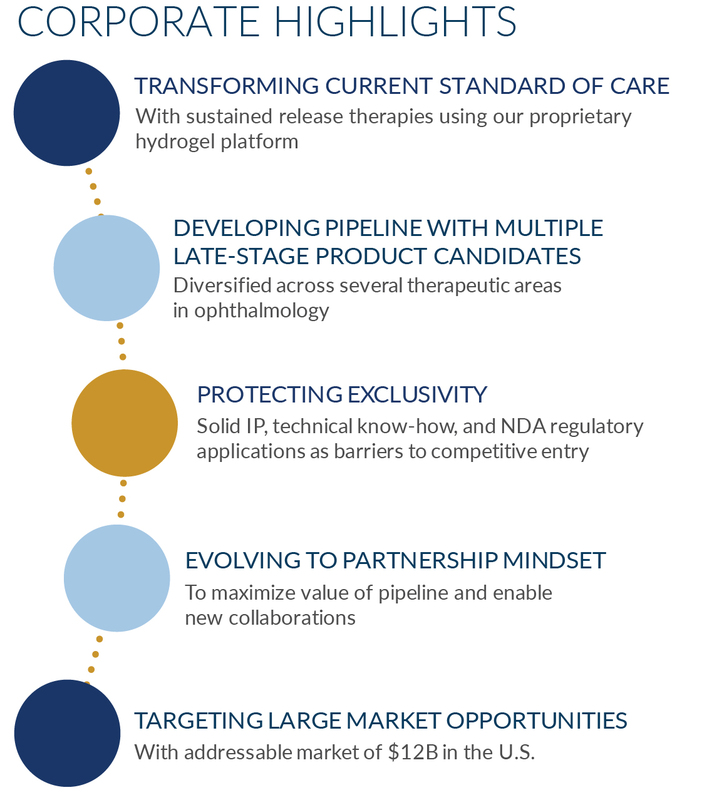 Ocular Therapeutix, Inc. (NASDAQ:OCUL) is a biopharmaceutical company focused on the formulation, development, and commercialization of innovative therapies for diseases and conditions of the eye using its proprietary bioresorbable hydrogel-based formulation technology. Our product pipeline candidates are designed to provide differentiated drug delivery solutions that reduce the complexity and burden of the current standard of care by creating sustained release alternatives. It is our intention to develop a product portfolio to overcome the issues of patient compliance and adherence by providing means of more consistent and reliable drug dosing. Ocular Therapeutix’s lead product candidate, DEXTENZA® (dexamethasone insert) 0.4mg, has completed Phase 3 clinical development for the treatment of ocular pain and inflammation following ophthalmic surgery. OTX-TP (travoprost insert) is in Phase 3 clinical development for the reduction of intraocular pressure in patients with primary open-angle glaucoma and ocular hypertension. The Company’s earlier stage assets include OTX-TIC, an extended-delivery travoprost intracameral implant for the reduction of intraocular pressure in patients with glaucoma and ocular hypertension, as well as sustained release intravitreal implants for the treatment of retinal diseases. These intravitreal implants include OTX-TKI, a tyrosine kinase inhibitor (TKI), and, in collaboration with Regeneron, OTX-IVT, an extended-delivery protein-based anti-vascular endothelial growth factor (VEGF) trap, both for the treatment of retinal diseases. Ocular Therapeutix’s first product, ReSure® Sealant, is FDA-approved to seal corneal incisions following cataract surgery.